Pattaya residents were urged to not patronize child street vendors or give to beggars as part of an effort to reduce exploitation of minors and women in the tourism industry. 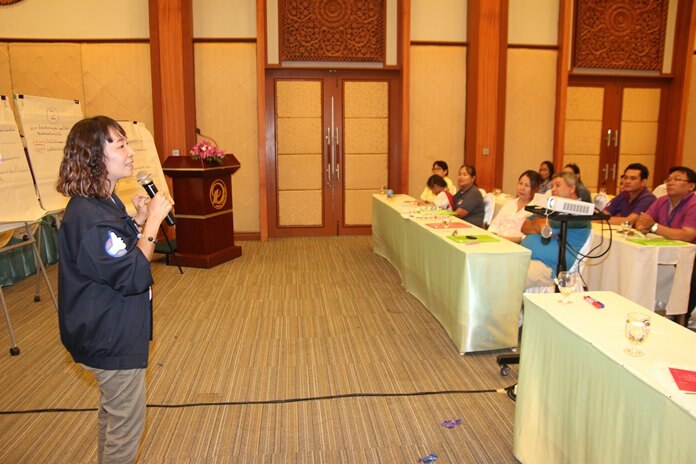 Nisarat Nuntawan Na Ayuttaya, Childsafe Project Coordinator for NGO Friends-International Thailand was the lead speaker at the seminar at the Diana Garden Resort organized by the Ministry of Tourism and Sports and Burapha University June 16. Nisarat Nuntawan Na Ayuttaya of NGO Friends-International Thailand encouraged everyone to report any suspected child prostitution, as underage boys and girls are not only offered to foreigners, but Thais as well. She said tourists should not buy goods from children selling on the street and not give money to child beggars as it contributes to human trafficking. She also encouraged everyone to report any suspected child prostitution, as underage boys and girls are not only offered to foreigners, but Thais as well. She said people can call the NGO at 086-971-8861 the ChildLine at 1987, the Tourist Police at 1155 or local police at 191.